“So much light is shined on gymnasts, football players, singers and actors. It’s not often that you get to shine a light on academics.” That’s Mark Burnett, prolific reality show producer, who’s come up with another bright TV idea. Our Little Genius is a game show on Fox that gives children the chance to put their knowledge on a chosen topic to the test for cash prizes. Whatever your thoughts on exposing minors to the pressures of a show like this might be, it’s undeniable that Our Little Genius taps into a current TV trend. From Are You Smarter Than a 5th Grader? to a recent episode of MTVs True Life that tracked a pack of super-bright teens (and even the broadcasting of the Scripps National Spelling Bee), TV seems slowly to be turning its attention to what really matters: our grey matter. Two members of an all-round, high-achieving family are represented in Rubens with a Geranium (1801) at the NGA, by the American artist Rembrandt Peale (1778 – 1860). 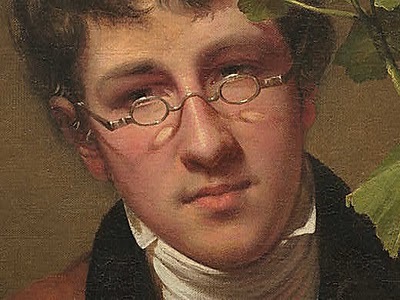 Peale’s father, the artist and museum proprietor Charles Willson Peale, gave all of his 17 children an auspicious start in life by naming them after famous artists and scientists. But Pappa Peale didn’t always get it right: Rembrandt followed in the footsteps of his namesake to become a painter, while his brother Rubens, shown here, became a botanist, despite his name! 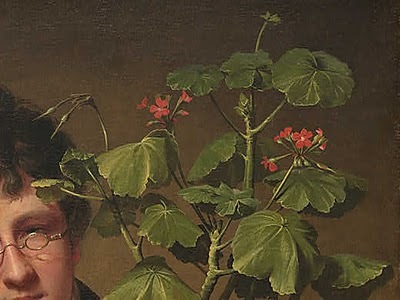 Here’s Rubens aged 17, presenting an early horticultural triumph (this geranium specimen was reputedly the first grown in the New World). 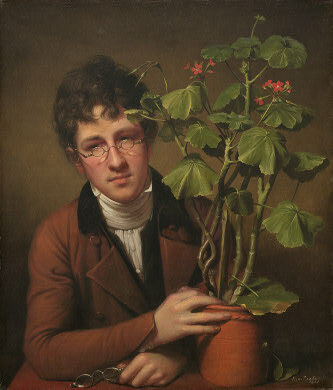 He’s proud of his potted phenomenon, touching the terra-cotta tenderly and letting the tendrils tousle his hair. But this picture is as much a record of the artist’s skills as it is of the progress of a young scientist. Because even though Rembrandt is a little longer in the tooth than some of our TV prodigies, he’s still only 23 when he paints his brother in this picture. There’s a wonderful naturalism here that’s based on his careful attention to detail. See how he captures the onset of decay on a leaf near the bottom of the plant. There’s subtle shading to bring out the shape of the nose and brows and and look how the light (which shines in from left) glints pin-sharp on the rims of the specs. It seems Rembrandt was much like the precocious genius type we are seeing more of on our TV screens. He made his first work (a self-portrait) at 13. He worked as a museum director while still in his teens. He’d painted George Washington and Thomas Jefferson from life by his 22nd birthday. In the year he painted our Rubens portrait, he also found time to dig up prehistoric mammal bones near New York and take them to London for exhibition the following year. Rembrandt’s reference point for all this early achievement was most likely his father who, in addition to his artistic pursuits, worked as a sometime soldier, inventor, agricultural reformer, author, political activist and naturalist. Rembrandt went on to have a career of almost 70 years, producing over 1,000 works. This is all well and good, but just sometimes it’s a comfort, when we’re in the presence of these high percentiles people, to see that even they are human and prone to the odd hiccup or mistake. Because – and forgive me for pointing out the obvious here – did anyone else notice that he’s given Rubens two pairs of glasses?